« ‘Local Sustainable Homes’: Now Available! 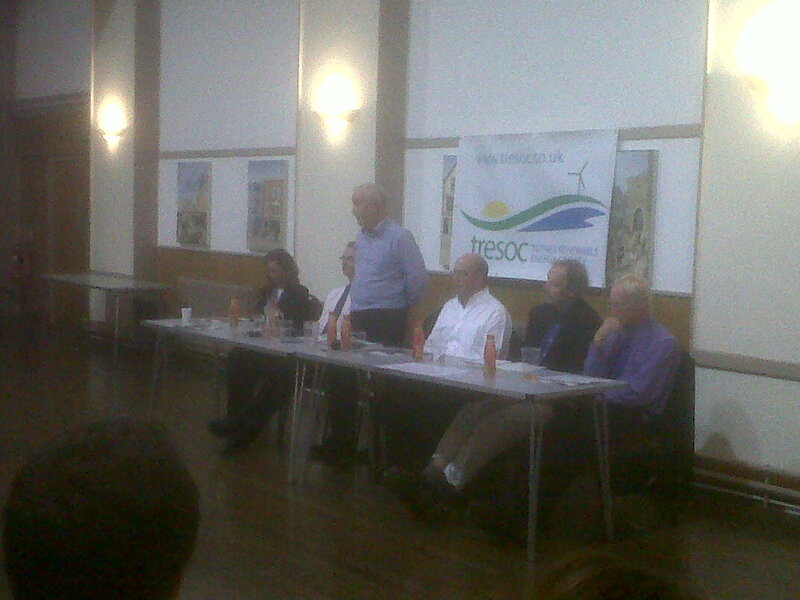 Last Friday, in Totnes Civic Hall, saw the historic launch of the Totnes Renewable Energy Society (TRESOC). A key piece in the relocalisation of Totnes and district, TRESOC offers members of the community the chance to buy into their own renewable energy company. The evening started with Cllr. Tony Whitty, the Mayor of Totnes, who put the work of TRESOC in the context of the town’s wider spirit of being a pioneering town, a spirit now embodied in its identity as a Transition Town. He mentioned the 74 photovoltaic panels now adorning the Hall as part of the Transition Streets initiative, which will be formally ‘switched on’ at the Energy Fair next Saturday. TRESOC, he told the nearly-full Civic Hall, is another key step towards enhancing the sustainability and resilience of Totnes. 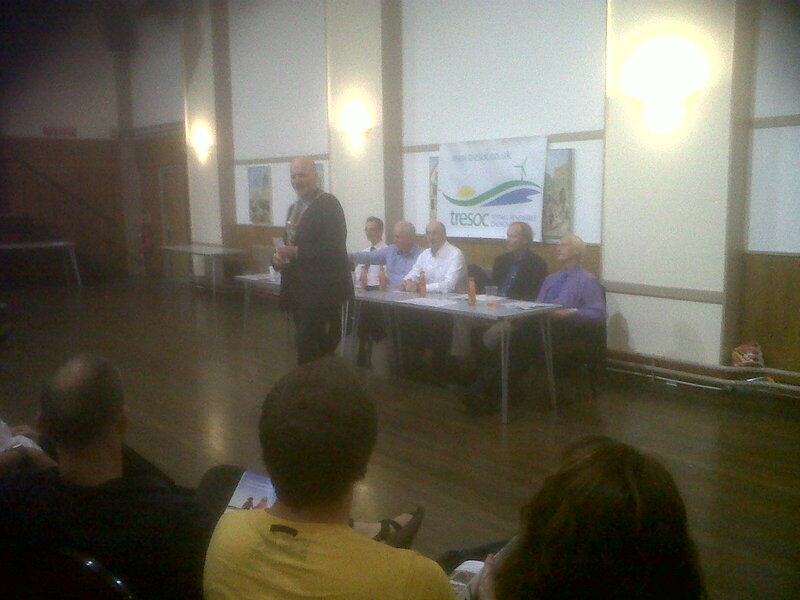 Cllr Tony Whitty, Mayor of Totnes, opening the evening. He was then followed by Quentin Compton-Bishop from the National Energy Foundation, who have supported TRESOC in getting to the stage they have. They run a range of schemes, such as ‘Old Home, SuperHome’, various education initiatives, and also offer support to community energy projects, this being one of them. He pointed out that the UK Government’s ‘Low Carbon Transition Plan’ commits that by 2020, 15% of energy will come from renewables, and by 2050, 80%. We currently produce 3% from renewables. “How on earth will we manage it?”, he asked. One of the key ways will be through community energy projects, but these can take years (one in Oxford took 15 years), but they are key, and offer a far more efficient way of deploying money to produce renewable energy. Ian Bright (standing) together with the other TRESOC directors: (from the left) Hilary White, Richard Hoyland, Frank Bennatt and Alan Langmaid. The bulk of the presentation was taken up by Ian Bright, one of the Directors of TRESOC. 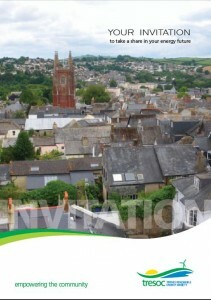 He offered a potted history of TRESOC, which had emerged from a Transition Town Totnes Open Space day on energy in late 2007, where the idea was first mooted and the first meeting of potential directors arranged. For 6 months meetings were open, and then it closed with 5 Directors. Its aim is to see a massive upscaling of renewable energy generation in the area, for the benefit of the community. Wind, he argued, is by far the most abundant and cost-effective of the renewables. Of the renewable energy capacity that needs to be installed over coming years, 70% of it will be wind, half of that onshore, half of it offshore. This 5-fold increase in wind capacity needs to have some real involvement of communities, after all, we all use it, and should all take some degree of responsibility for it. TRESOC offers the possibility for the community to get involved and to take a stake in renewables. By 2012, wind generation will have overtaken the country’s nuclear generating capacity. As a community, he continued, we need to empower ourselves to operate in this competitive field. The main obstacle, as we all have observed, is planning. While repeated surveys show that 70-80% of people are in favour of windpower, they are still perceived as unpopular thanks to a vocal minority. If a community takes the leadership, and owns the development, this will benefit the community as well as local businesses and jobs, and perhaps aid with planning concerns. This is the much-touted ‘green economy’, and communities have a big role to play in that. TRESOC formed in 2007 and started almost immediately looking for projects. They are now ready to offer shares for between £20 and £20,000 and want as many people to become members as possible. 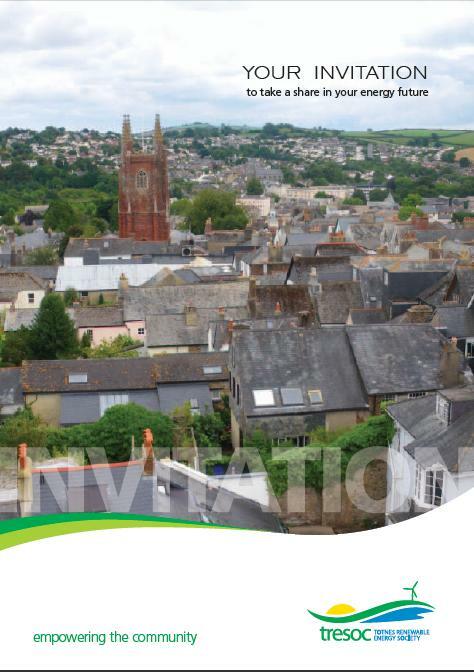 To begin with, TRESOC is looking at 2 major projects, the Totnes Community Wind Farm, 2 2.3MW turbines to be sited about a mile from Totnes town, and the Totnes Anaerobic Digestion Partnership, which would process most of the area’s organic food waste and turn it into biogas. Members can’t sell their shares for the first 3 years, but they can be left in wills. Interest from the profits generated will be dispersed among the membership. It took a while to find a suitable site for wind. Finding such sites is very difficult, they mustn’t be in areas of outstanding natural beauty, and must be close to a grid connection, away from phone masts and so on, and after a search, the site was identified on the edge of Totnes. The 2 turbines will generate enough energy for 2,500 homes. This offer of membership will be open for the next three months, during which time the aim is to generate as much share ownership as possible. Once people have bought shares, they can increase their investment at any time, but after 3 months, people will not be able to become new members. The full Prospectus can be downloaded here. Ian’s presentation was followed by a break and then questions and answers, which prodded and probed what TRESOC was offering. It was a fascinating evening. I for one will be buying shares, it is so important that this initiative succeeeds. TRESOC is aiming to raise £800,000 in share investment from the community within 3 months, a tall order. Hopefully it will be successful (we were told that the eyes of central government are watching TRESOC as a national toe-in-the-water) and accelerate the roll out of such initiatives nationally. It felt to me like a historic evening, the launch of something very important, and there was a widespread acknowledgement of the work the Directors had put in to the project to get it this far. Where it goes now is up to the community. You can keep up with developments at TRESOC via their website.